Crown Court is a British courtroom drama TV series set in the fictitious town of Fulchester in which each single case is presented in the same format: two episodes serve for elaboration of the case in mind, while the third episode serves for attorneys to present their defense. Afterwards the evidence is presented - a special jury comes to bring the final verdict in place. John Alkin, John Barron, Joseph Berry, Bernard Brown, David Ashford, Richard Colson, Michael Gover, Dinah Sheridan, Terrence Hardiman, Robert Powell, Derek Hockridge, Edward Jewesbury, Don Henderson, Charles Keating, Kenneth Cope, William Mervyn, et al. 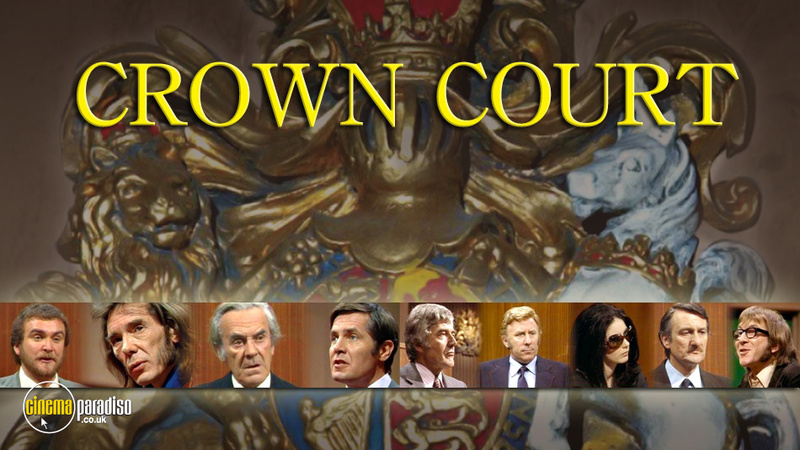 Arguably one of the most memorable legal dramas in the history of British television, Crown Court was originally broadcast on ITV and was water cooler TV. The show used fictional cases but the jurors were actually members of the public. Different endings were filmed to account for the verdict of the jury and this added an intensity and twist to the normal courtroom dramas of that era. The second volume of the courtroom series that enacts fictional cases in a court setting, with a jury made up from members of the public. Arguably one of the most memorable legal dramas in the history of British television, this series used fictional cases but the jurors were actual members of the public. Different endings were filmed to account for the verdict of the jury and this added an unusual twist to the normal courtroom dramas of the day. This volume contains the next twelve stories (in production order) and features cases which cover a wide range of those that would come before a courtroom. Episodes comprise: 'The Mugging of Arthur Timmons', 'Love Thy Neighbour', 'The Death of Dracula', 'Wise Child', 'Beware of the Dog', 'Theft by Necessity', 'The Gilded Cage', 'Credibility Gap', 'The Long Haired Leftie', 'There Was a Little Girl', 'A View of Matrimony', 'A Score Settled' and 'Patch's Patch'. 12 more episodes from the popular British courtroom drama. The series used fictional cases but the jurors were actual members of the public. Different endings were filmed to account for the verdict of the jury and this added an unusual twist to the normal courtroom dramas of the day. Episodes comprise: 'To Catch a Thief - Regina v Halsey', 'Just Good Friends - Regina v Beaumont', 'Who Was Kate Greer? - Regina v Archer', 'A Right to Life - Abbs v Richards', 'The Inner Circle - Heywood v Blower', 'The Black Poplar - Regina v Tressman', 'The Open Invitation - Regina v Sellars', 'Beggar on Horseback - Regina v Erringburn', 'The Night for Country Dancing - Regina v Airey', 'Mrs. Moresby's Scrapbook - Regina v Moresby', 'My Old Man's a Dustman - Regina v Cousins and Cousins and Mayes', 'The Judgement of Solomon - Regina v Kamuny and Kamuny'. 12 more episodes from the popular British courtroom drama. The series used fictional cases but the jurors were actual members of the public. Different endings were filmed to account for the verdict of the jury and this added an unusual twist to the normal courtroom dramas of the day. Episodes comprise: 'Destruct, Destruct - Regina v Ainsworth', 'Public Lives - Regina v Williams and Pastor', 'The Thunderbolts - Easter v Goss', 'Treason - Regina v Clement', 'A Stab in the Front - Regina v Blandford', 'To Suffer a Witch - Regina v Vincent', 'Hit and Miss - Regina v Burnett', 'No Spoiling - Regina v Smithson', 'The Age of Leo Trotsky - Regina v Smith', 'Robin and his Juliet - Regina v Tomlin', 'The Most Expensive Steak in the World - da Costa v McIver' and 'Message to Ireland - Regina v Parfitt'. 12 more episodes of the popular 1970s/early '80s ITV courtroom drama series set in the fictional Fulchester Crown Court. While the series showed fictional cases, the jury was made up of actual members of the public. Different endings were filmed to account for the jurors' verdict, adding an unusual twist to the normal courtroom dramas of the day. A television institution that lasted for over a decade, Crown Court was a much-loved courtroom drama which, although the cases were fictional, used 'real' jurors chosen from members of the public. Multiple endings were prepared for each story, dependent on whether the accused was found guilty or acquitted of the charges, giving each story a strength and energy which raised it far above that of normal courtroom dramas. This volume contains a further twelve stories in production order, presenting compelling cases covering a wide spectrum of what would come before a courtroom - including murder, child abduction, libel and fraud. Originally transmitted in 1974, the dramas feature appearances by Dinah Sheridan, Richard Wilson, Robert Powell, Don Henderson, Kenneth Cope, Gwen Taylor and Graham Crowden, among many others. 12 episodes from the courtroom drama series set in Fulchester Crown Court. Richard Wilson stars as Jeremy Parsons QC, presenting to the jury fictional cases spanning murder, fraud and child abduction. The jury, comprised of members of the public, determine the outcome of the case based on the strength of the evidence and arguments presented.